Camping Saint James offers self-catering accommodation set in a wood just a 1 km from Queyras Natural Regional Park and 18 km from Serre Ponçon lake. It features a playground area for children and free, private parking on site. Mobile homes and chalets all have a private, furnished garden area or terrace. Each has a living area with an equipped kitchenette including a coffee machine, microwave and a stove. There is also a private bathroom with a shower. Free Wi-Fi access is available in public areas. There is an area reserved for ball games and entertainment staff is on site. Hiking trips can be organised, amongst other activities such as canyoning, rafting and rock-climbing. You will find a supermarket and restaurant just 1 km away, and Guillestre Train Station is 3 km away. Please note that from November to April, heating is at an extra cost in the chalets, and is calculated according to consumption. 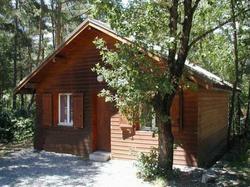 This wooden chalet has a private, furnished garden area, an equipped kitchenette and a private bathroom with a shower. This mobile home has a private, furnished garden area, an equipped kitchenette and a private bathroom with a shower.